"These are not a species, they are not endangered ... they shouldn't exist." 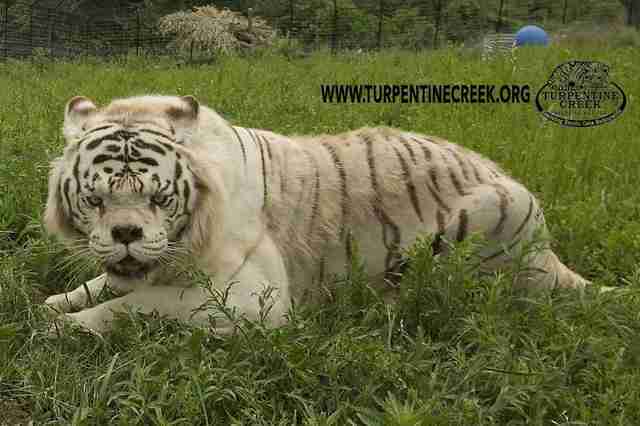 One look at Kenny and it's clear why white tigers shouldn't be bred. Kenny was rescued in 2000 at around 2 years old. He was living in filth at a private breeder in Arkansas, but because of his obvious deformities he wasn't pretty enough to sell and the breeder called Turpentine Creek Wildlife Refuge to get rid of him. "The gentleman that we rescued him from said he would constantly run his face into the wall," Emily McCormack, animal curator for Turpentine Creek, told The Dodo. "But it was clear that that wasn't the situation." 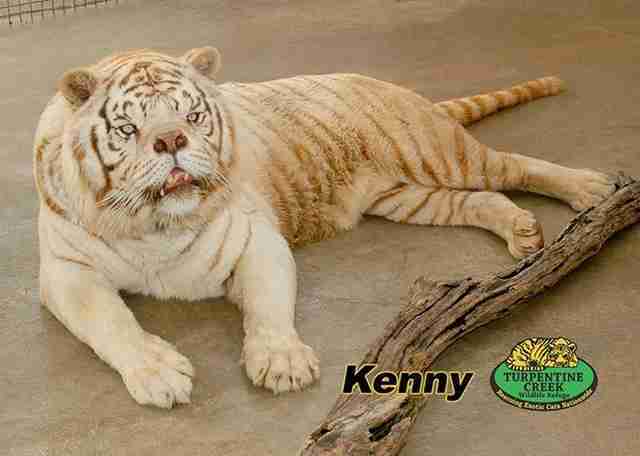 Rather, it was apparent that Kenny's looks were the unsurprising result of the generations of inbreeding that go into creating white tigers. With his short snout, broad face and obvious dental issues, most people wouldn't immediately recognize Kenny as a tiger. 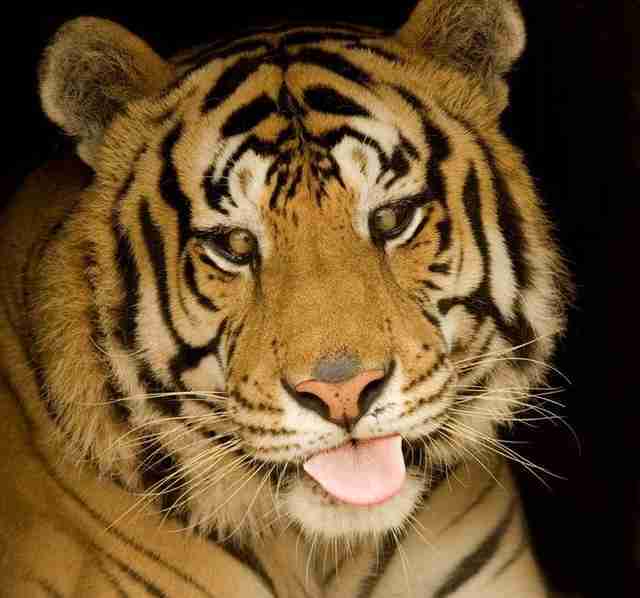 Willie, an orange tiger who was rescued with him and was likely his brother, had completely crossed eyes. While breeders, and the zoos and entertainers that use them, paint white tigers as an endangered species in need of conservation efforts, that story couldn't be further from the truth, said Susan Bass, PR representative for the Florida sanctuary Big Cat Rescue (BCR). "White tigers are not a species, they're not endangered, they're not in the wild," Bass told The Dodo. 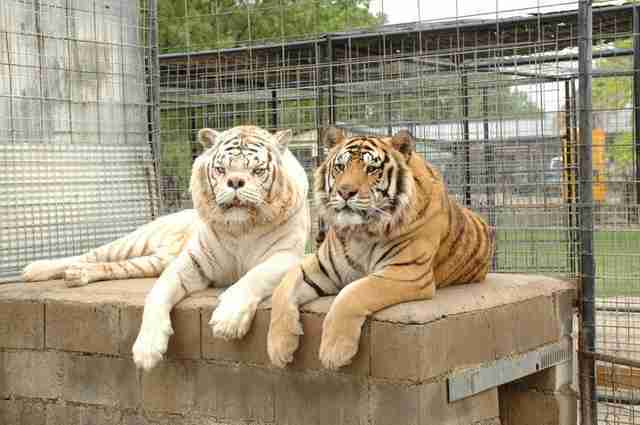 "There are so many misconceptions about white tigers." According to Bass, a white tiger hasn't been seen in the wild since the 1950s, when a light cub was found with a family of normal orange tigers. The person who found him was intrigued by the natural color variation, so he stole the cub away from his mother and siblings. Today's white tigers are all descendents of that original white tiger, she said, and are the result of countless generations of inbreeding needed to get the double recessive gene that gives tigers a white coat. "They're not normally found," Bass explained, noting that a white tiger likely couldn't even survive in the wild because they'd stick out too much. "In order to get that [color], breeders have to breed tigers over and over again to get that gene to come forward." 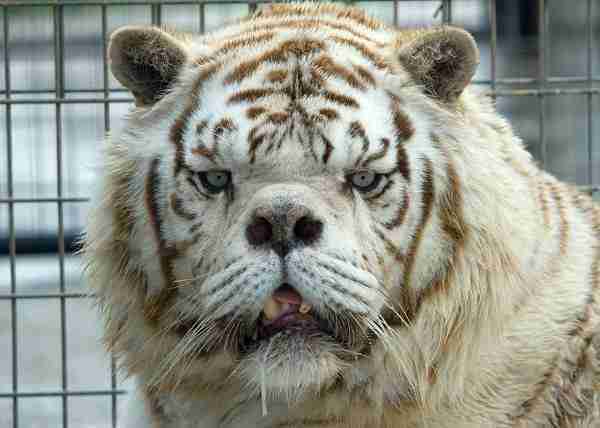 The result of that inbreeding is tigers like Kenny, whose parents were likely siblings. And he's not alone; the population as a whole has been remarkably damaged by decades of inbreeding. Bass said that virtually all white tigers have crossed eyes — even if you can't see it, their optic nerves are crossed - and a host of other medical problems. "They don't live as long [as other tigers]," she explained. "They have kidney problems, they have spine issues." 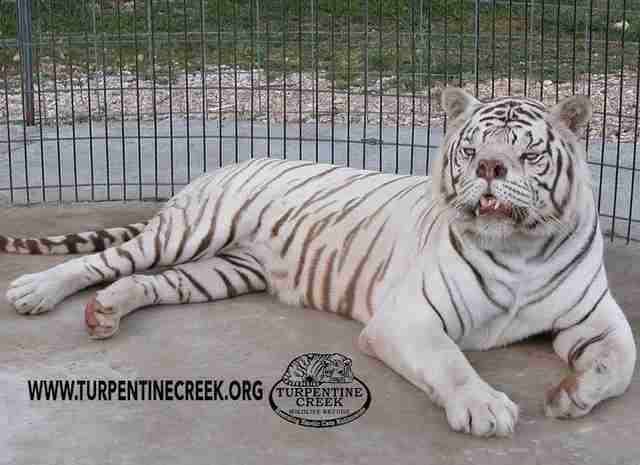 Many white tigers also have cleft palates, including one who lives at BCR. 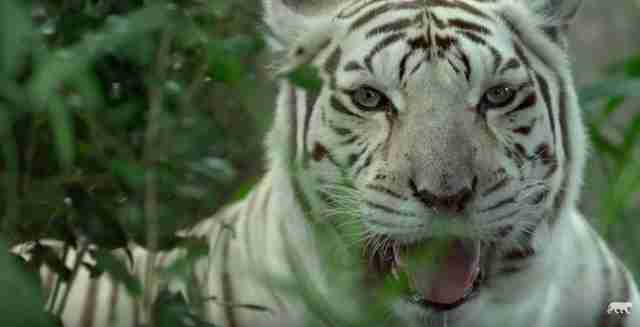 "Our white tiger Zabu has a missing upper lip and it looks like she's always smiling," Bass said. While Kenny's deformities are more apparent than other white tigers', it's unclear whether he's truly exceptional — or whether he was just one of the lucky ones to escape. "To get that one perfect, pretty white cub, it's one out of 30," Bass explained. "What happens to the other 29 ... euthanized, abandoned ... who knows." Unfortunately, breeders and the people who buy white tigers continue to spread the myth that they are an endangered species and need conservation, or that it's beneficial to breed them, which keeps the profitable industry going. "These are not a species, they are not endangered, they don't need to be saved, they shouldn't exist," Bass said. "[Breeders and owners are] duping the public into thinking that they need conservation, and paying money to see them." But at least Kenny's story had a better ending than most. While some media outlets have mistakenly reported that Kenny had Down syndrome, McCormack said the playful tiger appeared to be mentally normal. "He acted like the rest of them," she said. '"He loved enrichment, he had a favorite toy ... he ran around in his habitat, he ate grass, he just looked kind of silly." "Everybody loved Kenny," she added. "He had a great personality ... he loved all the keepers, loved all the animal care staff." Unfortunately, like many white tigers, his life was a short one. While tigers can easily live to be more than 20 years old in captivity, Kenny died in 2008 at 10 years old after a year-long battle with melanoma. It's unclear if the disease was a result of his breeding. Kenny's still missed at Turpentine Creek. McCormack said that while Kenny's clearly a poster boy for the problems with white tigers, she hopes he can teach a broader lesson as well. "Tigers in captivity, especially in the private industry, just aren't genetically pure," she said. "The problem is privately owned exotics in captivity." It's best to stay away from zoos or other facilities that own white tigers as they're almost always disreputable — the American Zoological Association (AZA), the foremost zoo accreditation group in the country, has outright banned members from breeding white tigers. 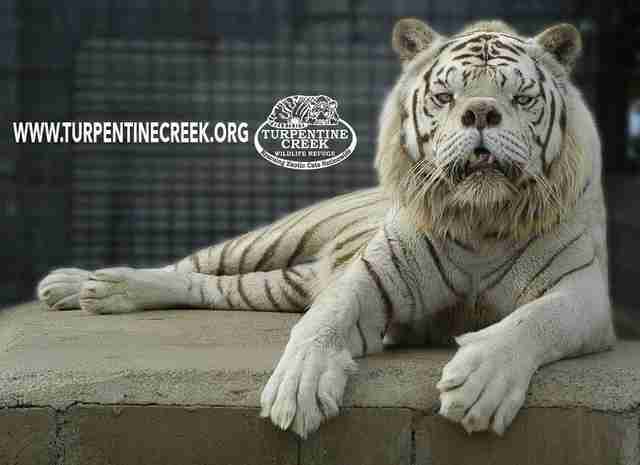 If you'd like to help rescued white tigers and other animals like them, you can make a donation to Turpentine Creek Wildlife Rescue or Big Cat Rescue.